Founding father and an honorary lifetime member of Bicycle Network. 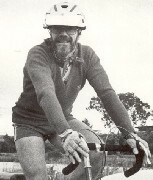 He was a towering figure in Victorian cycling, who sadly passed away in January 2004. “Ron Shepherd was the master touring cyclist. There was not a touring cyclist he did not touch.